Most people are familiar with slow cookers, which make convenient one-pot meals over several hours. After all, having an appliance in the kitchen that simplifies the cooking process with a healthy approach can be important for many busy and on-the-go families. That being said, there’s a similar cooking appliance you may want to check out: the pressure cooker. You will definitely appreciate the speed and remarkable flavor achieved with pressure cooker recipes. Similar to crockpot recipes, all you have to do is place ingredients in the pot and switch it on—that’s it. The difference is that everything cooks much faster with a pressure cooker. A pressure cooker is a sealed saucepan for cooking food under extreme pressure. 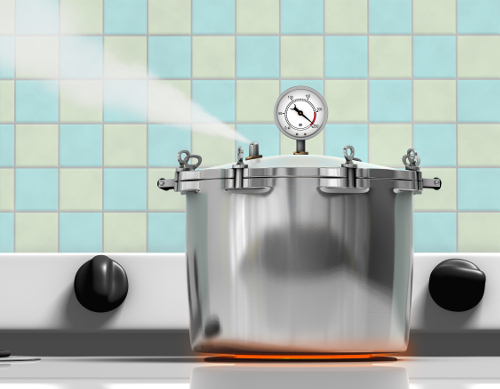 The origin of pressure cookers dates back to 1679, when French physicist Denis Papin designed a method for using internal steam pressure to speed the boiling point of water and, in turn, the cooking time for food. Papin’s invention was called the “steam digester” at the time. The earliest models of modern-day pressure cookers were released in 1938, but demand for these cooking appliances slowed during World War II when the popular pressure cooker aluminum was rationed for military use. In the 1990s, pressure cookers became popular once again in the U.S., and today they are used as a healthy way to cook healthy meals fast. How does a pressure cooker work? You use it similar to a big stockpot, but the lid is airtight, and all the steam builds up inside the pot. This combines the high pressure, and cooks food very fast. Also, higher pressure will produce shorter the cooking times. Not to mention, pressure cookers will cook about one-third the time as normal-cooking appliances. It is a good idea to find a pressure cooker that fits your needs. If you’re a family of one or two, a smaller 4-quart pressure cooker will work just fine. For a slightly bigger family (up to five), 6- or 8-quart cookers should suffice for day-to-day cooking. Alternatively, you can use a stovetop cooker. It is used like an electric pressure cooker, or normal pot or pan. Stovetop pressure cookers allow you to sauté or sear food before pressure cooking it. This gives the food a distinct flavor that electric cookers likely can’t match. Electric cookers are often programmable, and similar to a slow cooker, you can place your ingredients inside and leave it unattended. What pressure cooker recipes should you try? To get started, the following are five delicious and nutritious pressure cooker recipes for busy individuals and their families. Why buy a rotisserie chicken from the grocery store when you can easily make your own version at home? The following chicken recipe is very versatile, and you’ll get a crispy, juicy entree or the perfect addition to your salad or tacos. This chicken isn’t injected with any undesirable ingredients either. In about 30 minutes, you have a great chicken without the rotisserie. Rub chicken with one tablespoon of olive oil, and sprinkle with salt and pepper. Place the onion wedges and garlic cloves inside the chicken, and use a butcher’s twine to secure the legs. Turn on the pressure cooker, and press the sauté button. Add the remaining olive oil to the metal pan, and when hot, add the chicken and sear both sides for about four minutes per side. Remove the chicken and set aside. Place the trivet at the bottom of the metal pan, and add the chicken broth. Sprinkle and rub the other spices over the entire chicken. Place the chicken, breast side up on top of the trivet, and secure the lid. Make sure the lid is in the “sealing” position. Set the pressure cooker to manual and set timer for 25 minutes. When the timer beeps, allow the pressure to release naturally for 15 minutes. If the lid does not open, quick release the remaining pressure before removing the chicken. Allow the chicken to rest for five to 10 minutes before serving. Sure, you’ve tried butter chicken, but pressure cooker butter chicken is that much better. The following recipe takes under a half hour, even if the chicken is frozen. It also includes many traditional Indian spices like curry powder, ginger, and garam masala. You can serve it over quinoa or brown rice. Turn the pressure cooker on sauté mode, or press chicken/meat. Place a stick of butter into the pot, and let it fully melt until it becomes foamy, and smells good. Toss in the garlic and onions, and cook until halfway done, and add the coconut milk, chicken stock, and tomato paste. Mix well. Add the curry powder, ginger, ground cumin, garam masala, cayenne pepper, and salt, to taste. Place thawed or frozen chicken in the pot, and cover with sauce. Cook on manual for 15 minutes, or cook meal using the chicken/meat button. Once finished, let sit in pot for 10 minutes, and if the lid hasn’t unlocked, release the excess steam and remove the lid. If the chicken was already diced, skip the next step. Turn pot back on the sauté or keep warm method, and with a sturdy spoon and fork, gently cut and shred the chicken into desired size pieces. Mix in the coconut flour and water together, and then add it to the pot and mix well. Let the pot boil until sauce has thickened. Serve the chicken over a bed of quinoa or brown rice, and use cilantro for garnish. Lamb stew is a great recipe to make with a pressure cooker. The following lamb stew pressure cooker recipe contains healthy veggies like acorn squash, carrots, and onions, and will take 35 to 40 minutes, rather than eight hours with a slow cooker. This recipe will serve four to five people. Peel, seed, and cube acorn squash. Slice the carrots into thick circles, peel the onion, and slice it into moons. Place all ingredients in the pressure cooker, and cook on high for 35 to 40 minutes. Carefully release the pressure before unlocking the lid. Let it rest for 10 minutes before serving. Have you tried creamy Thai coconut chicken soup? If not, you’ll love this pressure cooker recipe. It’s ready in less than 20 minutes, and the coconut milk also creates a dairy-free creamy broth. The recipe calls for an Asian root called galangal that may be hard to find outside Asian markets, but you can substitute with ginger if necessary. Turn on sauté mode on the pressure cooker, add the onion, and sauté for 10 seconds before adding the chicken. Sautee the chicken until the surface turns white, and add the Thai curry paste, galangal, bell peppers, kaffir lime leaves, and stir to mix well. Add the chicken broth, salt, and sugar, and cover the pot and on high pressure for 10 minutes. When it beeps, turn to quick release. When the valve drops, remove the lid carefully, and add the coconut milk and lime juice to the soup. Stir well, and top with cilantro and serve immediately. A ramen bowl inspires the following pressure cooker recipe, but it uses zucchini noodles rather than ramen noodles. Mushrooms and broccoli gives the recipe a good serving of vegetables. The recipe is quick and easy, and only takes about 10 minutes to cook. Select the sauté function on the pressure cooker, and once hot, add the avocado oil, garlic, ginger, and steak tips. Cook for a few minutes, or until the beef is lightly browned on each side and the garlic and ginger is flavorful. Then, select cancel. Now add the mushrooms, broccoli, vinegar, beef broth, coconut aminos, and sriracha or hot sauce. You can also instead add the broccoli with the zucchini noodles once the soup has cooked if you want crispier broccoli. Stir and secure the lid. Select the manual function on the pressure cooker, and cook on high for eight minutes, and use the quick release to let the steam out. Open the lid, and add more hot sauce for a spicier bowl. Add the spiralized zucchini and broccoli if saved, and top with green onion. Serve hot. We hope you enjoy the recipes and a whole new way of cooking healthy meals in no time. However, there are a few things to remember. Never leave a stovetop pressure cooker unattended. Rice will cook in less than 10 minutes, while certain meats may take about a hour. The pot is under extreme pressure. Always use the quick release valve or allow it to de-pressure naturally. Never open the lid when it’s finished without following directions carefully. “Pressure cooking,” Wikipedia; https://en.wikipedia.org/wiki/Pressure_cooking, last accessed March 22, 2017. “Instant Pot Pressure Cooker: Review + Recipes,” Wellness Mama, Feb. 28, 2017; https://wellnessmama.com/77045/instant-pot-review/. “Instant Pot Faux-Tisserie Chicken,” Cooking with Curls, Jan. 8, 2017; http://cookingwithcurls.com/2017/01/08/instant-pot-faux-tisserie-chicken/. “Pressure Cooker Indian Butter Chicken,” Jay’s Sweet N’ Sour Life, January 24, 2017; http://www.jayssweetnsourlife.com/2017/01/pressure-cooker-indian-butter-chicken.html/. “Pressure-Cooker Lamb Stew,” The Paleo Mom, July 13, 2013; https://www.thepaleomom.com/pressure-cooker-lamb-stew/. “Creamy Thai Coconut Chicken Soup (Instant Pot),” RasaMalaysia, Nov. 30, 2016; http://rasamalaysia.com/creamy-thai-coconut-chicken-soup/2/. “Instant Pot or Slow Cooker Spicy Beef and Broccoli Zoddle Soup,” Wholesomelicious, Feb. 5, 2017; http://www.wholesomelicious.com/instant-pot-slow-cooker-spicy-beef-broccoli-zoodle-soup/. “20 Pressure Cooker Recipes (Plus How to Use a Pressure Cooker! ),” Dr. Axe; https://draxe.com/pressure-cooker-recipes/, last accessed March 22, 2017.